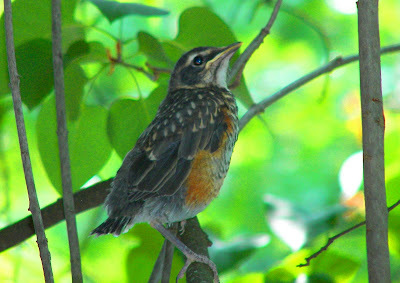 (Toledo, OH) I thought some exotic migratory bird landed in my lilac tree this afternoon, as the loud "SKREEEEEK" that the bird made sounded unlike any of the regular avian guests who hang around my house. Yet after locating the source of the unusual sound, I discovered that this was merely a baby robin, perched on a branch and perhaps calling for its mother. I never saw the bird fly, but it ambled around the branches with a fair amount of dexterity. Assuming that it does not fall from its perch, it should be ready to take flight in the next few days.